You can remove tracks from a playlist through our website and apps. Where would you like to remove tracks from your playlist? You can remove tracks from a playlist by clicking the ‘Add to playlist’ button below the track’s waveform and clicking on ‘Added’ to remove it. You can also bulk remove tracks from a playlist by going to the playlist’s edit page. You can access the edit page at any time by clicking the pencil icon below the playlist’s waveform. 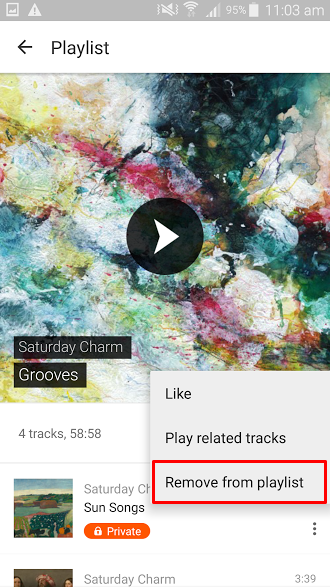 To remove a track from a playlist, go to the playlist page on the SoundCloud app, and tap the three horizontal dots to the right of the track name. Next, select ‘Remove from Playlist’ at the bottom of the menu. This will remove the track from your playlist on the app as well as on the desktop site.